Florida is perfect climate for growing citrus with its calm winters and nice wet summers.Full sun is best. Trees should be 15 feet from any structure. Citrus trees should be pruned yearly around Christmas time.Some people seem to be happy with a 20 to 30 foot tree. Trees this tall are a huge hassle to harvest. Ideal height is to reach the fruit you harvest off of a 6 foot ladder. Trees should be free of limbs 2 to 3 feet off the ground. New trees have a tendency to make low shoots or branches. Cut these off, particularly any branches growing from the root stock.Trees should have only one trunk.Citrus can be pruned year around however try not to cut off any blossoms. I shape my tree in a ball every December. If you have a small back yard do not let this deter you from growing trees. You can plant up to 4 different trees in the same container. Plant the trees as close to each other as you can in a diamond pattern, they will grow just fine. The trees pictured in the container are Meyer Lemon, Key Lime, Satsuma and Navel Orange which create a nice fruit basket to harvest from during citrus season. 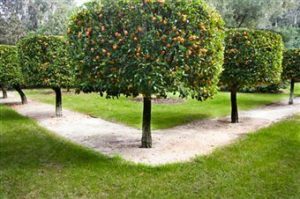 The trees shown are about 3 1/2 years old.If you never intend to plant your citrus tree in the ground use a container as a large as possible to achieve maximum harvest production. The size of the container will determine the size of the tree. We carry many different types of citrus trees like Oranges, lemons, limes, grapefruit, and figs to just name a few. Contact us today!